The fifth season of History Channel’s Vikings hasn’t been exactly what I would call “riveting”. The initial post-Ragnar episodes were pretty good as most of them was about Ivar’s ascent and how the Great Heathen Army are getting the best of the English. However, the fifth season has been quite puzzling with how things have turned out and how relationships formed and fizzled in the blink of an eye. The mid-season finale of Vikings Season 5, entitled Moments of Vision, was both beautiful and bewildering at the same time. The tenth episode of Vikings Season 5 is indicative of both the show’s strengths and weaknesses. The brilliant idea of using a non-linear narrative to tell the story of the battle between the forces of Lagertha and the Sami and the combined might of Ivar the Boneless and Harald Finehair’s armies is hamstrung by questionable creative decisions seen through the course of the season. NOTE: I spoil much of the show here, including some plot points in earlier seasons. You’ve been warned. Once Vikings Season 5 started, it was thing whole thing about them fighting among themselves and Floki setting up his own colony in what’s to become Iceland. Then there’s the warrior-bishop Heahmund, who has been a talking doll with a sword being passed around for the most part. Edge (Adam Copeland) is also in the show, taking to the acting thing now that it has been years since he retired from pro wrestling. The whole episode was reminiscent of Ragnar’s drug-fueled vision of his former life as a farmer in the sixth episode of Season 4, before he became the earl and then the king of Kattegat. It’s one of my most favorite scenes in the whole series due to how it was shot and how it impacted the audience’s understanding of the story and Ragnar’s situation. Perhaps they wished to do more of that in this episode by alluding more to visions and memories. Let’s see if I can cover all the major storylines of Vikings Season 5 referenced in this episode here. The episode starts with King Harald Finehair and his brother Halfdan the Black in opposing armies, with the latter having aligned with Bjorn Ironside earlier to travel the Mediterranean. Due to that experience, he isn’t that adverse to dying in this battle as he has since tasted the adventure he so desired. Ivar digs at Hvitserk for the motivations behind his changing of sides when Ubbe moved to sail back to Kattegat from England. He asks his older brother about his fears and regrets, and he could read him like a book. While the older brother, Hvitserk was out of his depth as he himself is unsure of what really made him switch sides and whether he truly regretted the decision. The truth is he did it for his own self-interest, which isn’t that surprising considering how immature he seemed to be throughout Seasons 4 and 5. Upon encountering the brother he turned away from in the battlefield, the only thing that saved him was Ubbe’s hesitation. Astrid’s predicament was interesting as Harald had been showing how much he was devoted to her, even letting her cut his famed hair. 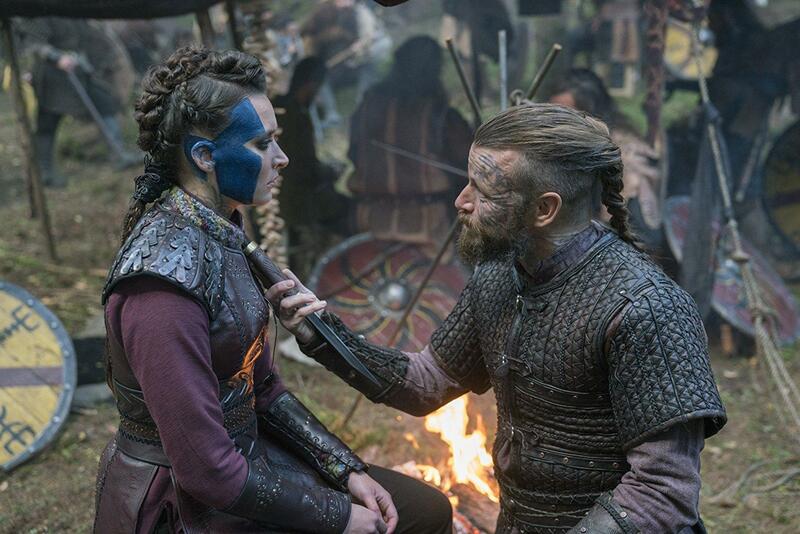 However, she was so mortified by the whole ordeal of being kidnapped and forced to marry the king of Norway, then later raped by Harald’s men upon being caught trying to send a message to Lagertha, that she wished for death by the hands of the Queen of Kattegat–the only one she truly loved. There was hope Astrid would come around via Stockholm syndrome. Unfortunately, Stockholm is in Sweden, and Harald is just the King of Norway. Bjorn and Snaefrid’s brief relationship was a weird one. Northmen seem to get tired of their spouses rather quickly throughout this show, and they would then move on to other relationships with the speed of Sleipnir. Same thing goes with the affair between Ubbe and Torvi, which turns Ubbe’s wife Margrethe into a mental case. All this tangling and crossing of relationships culminated in what could’ve been a tragedy. Sort of. Then there’s the Iceland subplot. This is the most perplexing, yet also perhaps the most poignant story in Season 5. Floki sailed out in search of something that could give him renewed purpose and discovered an uncharted land. He then goes back to Kattegat and was somehow able to attract a group to go back to the desolate-looking island. What followed was remorse and breakdown among the people, which results in some deaths. Because of what has transpired in that subplot, we know Floki might die somewhere in the second half of Vikings Season 5. Lagertha has more reason to die as well due to having offed Astrid herself. Torvi will go mad herself with having lost his eldest son Guthrum and being seemingly gaslit by her babysitter. Ubbe will have a handful with having lost a battle against his younger brother and a wife gone coco pops. 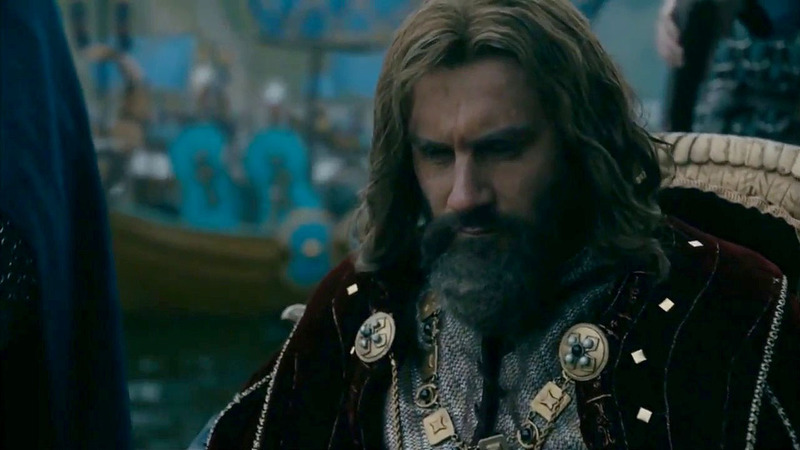 And there’s also the return of Rollo, who somehow sided himself with Ivar and Harald. Perhaps it’s simply a Machiavellian move of allying with the winners or a move to later gain a foothold in either the North or England. Rollo’s motivations are still unknown, but his presence does make things less stale as there’s now one more faction for everyone else to worry about. He just sat there. Like a tease. There must be something to how this episode was edited because I found myself going “Wait, what just happened?” a lot. There were transitions that were so jarring, the only reason why I can’t compare it to Suicide Squad is because I could still follow what’s going on in this one, albeit barely. What makes Vikings Season 5 worse is the Iceland subplot. You’d be watching someone’s visions and memories in the midst of battle, then BOOM—you’re back in Iceland. Perhaps the same can be said about the desert subplot earlier in the season. The changeover from England or the North to the sand dunes with seemingly drastic difference in coloring made for inconsistencies in visual tone which took much away from the storytelling. At this point, this is just production going through the motions and having senseless fun while it lasts. All of it goes back to Michael Hirst’s writing and how it may be affected by whatever is going on in the production of Vikings Season 5. I should be fine with the Iceland subplot because it has Edge in it, but that’s about it. There’s also the one thing all of the budget may have gone to, which is the skeletons scene. We might as well call it a Diablo flashback, because that’s what it really is. The skeletons looked so hilariously CGI that I couldn’t take it too seriously. Blizzard Entertainment can make better looking skeletons than that, you know. So Ivar has x-ray vision? Also, are his legs healing or something? He was able to stand without the crutch. Is it because of improvements on the iron leg supports he had added at the start of the season? Are we going to see Ivar miraculously able to walk on his own by the end of the season? There’s also the whole thing between Heahmund and Lagertha. What the hell is up with that? How did they really have a relationship all of a sudden? Lagertha has experience in dealing with devout Christians when Athelstan was still alive, so maybe that has lent to dealing with this Christian zealot. The whole “Now, I can die” dialogue was rather gauche. They let these things happen, and I have a problem with that. The show does have its own brand of cheesiness since the very first season, and that’s part of what made it fun. However, at this point, with how serious things have gotten in the story, you’d think they’ve already smoothed that out like in the third season. There are too many things to not have to care about in this season. I started seeing criticism of Michael Hirst’s writing as early the end of Season 3, and I can see now how they must have seen this coming from a mile away. The death of Ragnar and the dragging of the story to questionable grounds with such bad pacing in the aftermath made it obvious how much of the soul of the series is being lost. The only thing keeping this show alive for the most part are the hangers-on like me who are still watching just because they want to see how it all ends. I’m still interested with what happens to the characters, but there’s a lot less investment on the newer ones like Alfred and Heahmund. It’s not that they’re bad or their actors are bad, but they weren’t as well-developed and polished as the sons of Ragnar. We’ll see how things pan out with the second half of Vikings Season 5. There are promises being made as to how it can build upon whatever they came up with in the first half, and I do hope they can finally get something interesting going on in whatever is left of this show.